Why let the adventure stop when you hit the hay? 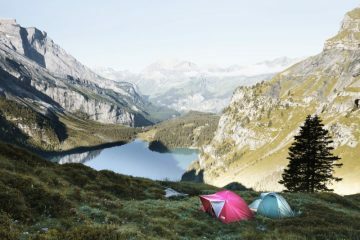 Camping is such an incredible way to feel connected to nature, and if you don’t want to venture off by yourself, going with an adventure buddy in a two-person tent is a great way to spend a weekend or week away outdoors. But with so many different makes, models and features available, where on earth do you start? Well, to help narrow things down a bit we’ve tested 12 of the best two-person tents on the market, to see which are worthy of your heard earned cash. The Coleman Kobuk Valley 2 is a heavy-duty tent that has quite a retro feel about it. It was simple to erect, with two poles that simply clip into place and provide the dome structure to this tent. It pitches inner first, so you’ll likely get the inside a bit wet if you’re pitching in the rain. There were enough tent pegs provided to put the tent up, however, I was only left with one remaining peg, so I was unabe to able to peg out the guy lines, which isn’t great when things get particularly windy. I thought the porch opening was slightly strange, as the slim entrance doesn’t make it the easiest to get in and out of. There’s not much in the way of a porch space either, so you’re going to have to keep your bags inside the tent with you, which might be a bit of a squeeze, and a massive pain if your kit is wet. The tent features a blackout bedroom, which is great if you struggle to stay asleep when the sun comes up, but you’ll need to make sure you have a bright torch with you, as you really can see bugger all inside without one – even in the day! Luckily, there is a ceiling clip to attach a torch to. The only issue I found with this feature, is that it seemed to make the tent into a bit of an oven, even in the mild spring sun, and I fear in the summer I would become somewhat of a boil in the bag human. When the weather isn’t quite as kind, the flysheet has a high waterproof rating (a hydrostatic head of 4,500mm), so it should shed water well. As it’s a dome-style tent, it doesn’t cope quite as well with winds as others on test. Ventilation was OK, with two small vents, but the materials weren’t the greatest for allowing airflow, so condensation could be an issue. The Kobuk Valley 2 is easy to pack away and it has a good-sized storage bag. Weighing in at 2,996g, I wouldn’t really want to take this tent backpacking. In a line: Heavy, but great for car campers who can’t sleep at dawn. The Vango Scafell 200 is the second cheapest tent in this review, so we were surprised to see that it was a middle-runner in terms of its weight (2,427g), and it packs down to a reasonable size, too. The tent is incredibly easy to pitch, and we’re pleased to report that it pitches all in one, so if you’re erecting your tent in the hammering rain, the interior is probably not going to get drenched. The flysheet (3,000m hydrostatic head rating) and ground sheet (6,000mm HH) both have impressive waterproof stats and are durable thanks to the 70 denier polyester fabric. We were particularly impressed by the space on offer inside the Scafell 200. Although it’s a tunnel tent, I could happily sit up and it will comfortably take two and some gear. There is also ample space in the porch for any extra kit or muddy boots. The doors are nice and large too, so you don’t have to be a contortionist to make a graceful entrance or exit. Where the tent doesn’t stand up to some of its more expensive competition is how it’s not the easiest to get the flysheet really taut. This means that in high wind and rain, the flysheet could be pushed against the inner tent, thus transferring any condensation into the living area. It’s also worth noting that, as the Scafell 200 is a tunnel tent, it is going to be less stable in high winds when compared to geodesic and semi-geodesic tents, but it does a pretty good job. In terms of features, it has a part mesh inner door that will go some way to help with ventilation, but it would have been nice to see some extra vents to help tackle condensation. There are a couple of handy pockets inside the tent, but no hooks, which is a shame. Oh, and we have to say, bugs absolutely love the colour of this tent. In a line: A good, budget-friendly tent for all but the worst weather. The Snugpak Journey Duo is an easy tent to erect, but it’s worth noting that it pitches inner first, which means it’s going to get wet if you’re putting the tent up in the rain (it’s handy for warm, dry conditions, though, where you can just use the inner to enhance ventilation). There are three colour-coded poles that help make light work of putting it up, and when it’s pitched, it’s easy to tighten the flysheet so that it’s not flapping in the wind. 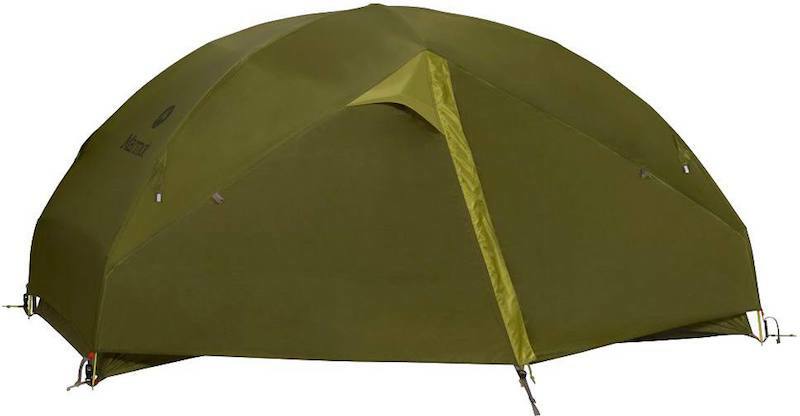 The flysheet offers a respectable hydrostatic head rating of 4,000mm and there is also an additional footprint included, which is a really nice extra as it helps protect the bottom of the tent. Due to its low profile, it performed well in windy conditions, and there was still just enough room for you to sit up straight. There’s only one porch, which means you might wake up your friend if you get up in the night for the loo, but it’s of a good size, so at least you’ll be able to exit swiftly. The inner door doesn’t feature a two-way zip, but it does have a half mesh ventilation panel, which is great for getting some extra air in without letting any pesky midges in. The inside is a little on the snug side for two people, but as long as you get on with each other, you should be fine sleeping in there together. There is just about enough room for two expedition rucksacks in the porch, but you won’t get anything else in. So, you’ll have to pop your rucksacks inside if you’re planning to do any cooking in there. Inside, the tent features a washing line, two storage pockets, a stash pocket for the inner door, a ceiling clip, and air vents, which help with airflow and keeping condensation levels down. When it came to taking the tent back down, it was just as easy as putting it up, so no complaints from me here. At 2,844g, it’s one of the heaviest, but it packs down well at least. In a line: Nice and easy to erect, but a bit heavy. Last year I visited Robens’ headquarters in Denmark and saw first-hand how the brand’s gear was developed and tested. One of the main things I came away having learned is that the brand takes a lot of pride in paying attention to every little detail, and this is something that certainly came across when I was reviewing the Voyager 2. The tent pitches either flysheet first, or all as one, which means you won’t be crawling into a soggy tent if it is raining. It’s simple to pitch, as well, which is in part thanks to the colour-coded poles. 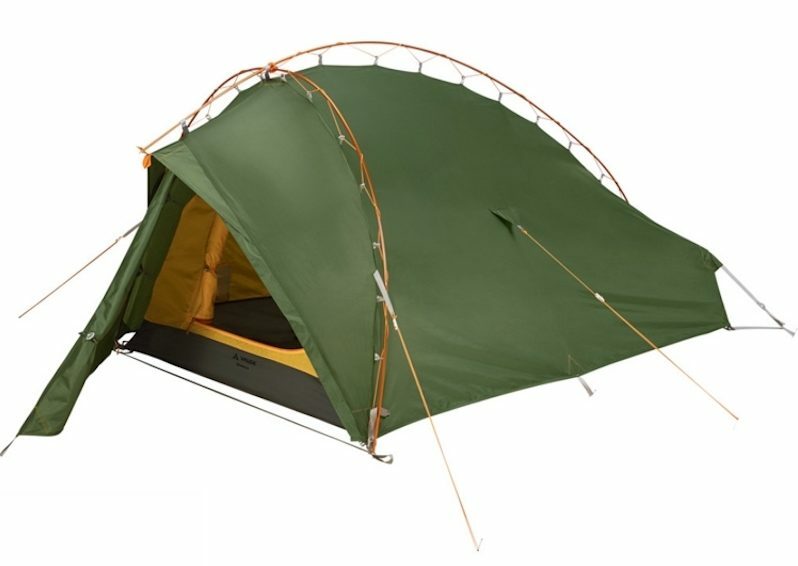 The tension straps at the bottom of the tent help pull the flysheet taut, and the user-friendly guy lines help increase this and add stability. Although it is a tunnel tent (which can sometimes be unstable in high winds), the tapered profile helps shed off wind, and we didn’t experience any issues with this in use. Ventilation is also very good in the Voyager 2. There is a large vent at the front and at the back, while half of the interior door can be unzipped to leave a lightweight mesh. There are also small toggles on either side of the tent, which you can use to pin up the flysheet by six inches, allowing greater airflow. It’s little details like this that make the Voyager 2 such an intuitive tent to use. There are several pockets inside, plus a hanging line from which you can dry damp clothes. Space is adequate, with two people easily fitting inside, and between the spare space in the tent and porch, you’ll be able to bring your gear inside with you. The Voyager 2 is not the lightest (2,739g), nor is it the most packable, but split it between two people on a multi-day hike and it’s not too bad at all. The thing is, for that extra bit of weight, you do get brilliant usability, and at a pinch under £200, it’s very good value too. In a line: A brilliantly designed tent at a very respectable price. 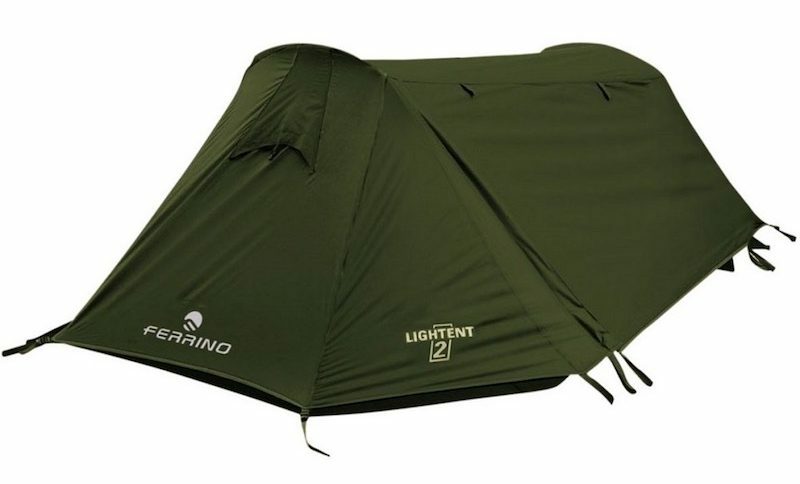 I’m glad the Ferrino Lightent 2 is a two-person tent, as I struggled a bit with putting it up on my own. After a slight battle I managed to get it pitched. Having said that, it was a bit of a stressful race against the clock, as the tent pitches inner first and rain clouds were on the horizon. I could have definitely used more tent pegs, as I used all that were provided in the bag and there was no room for error. In fact, there were none left to peg out the guy ropes. While it felt stable and the flysheet was easily pulled tight, in very strong winds it would have been nice to have that ability to peg out the guy ropes for peace of mind. 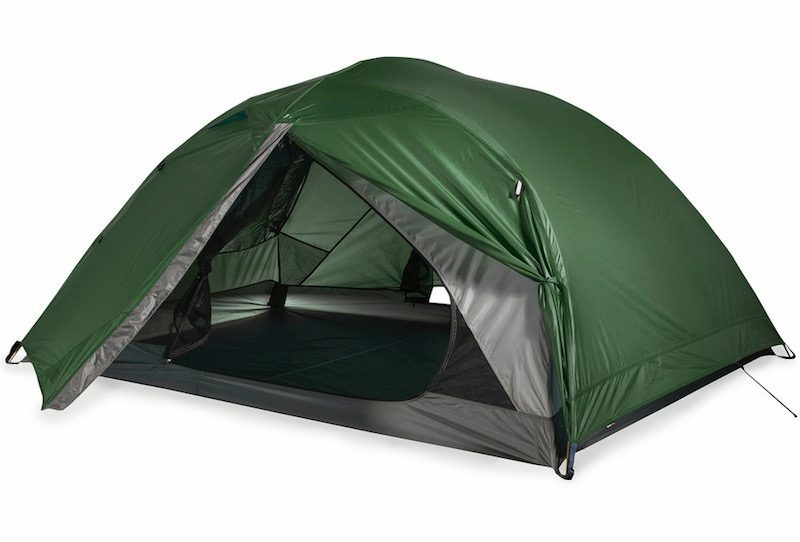 You’re going to need to be friendly with your tent companion in this tent, because it is a little tight for space. There is also very limited porch space to get your bags in, so you’ll have to make do with them at the bottom of the tent, providing neither of you are 6ft plus. However, there is a good amount of ceiling height at the head end of the tent, meaning I could sit up with ease (I’m 5ft 6in). As well as being snug, it’s worth noting there is only one entrance to the side of the tent, which unfortunately means you’ll have to delicately clamber over your tent buddy during the night if you need to pop to the loo. Hopefully, they won’t mind. There are two small storage pockets on the inside of the tent and a clip for hanging a torch from. I liked that the tent’s storage bag has a separate pocket for the tent poles, as this means you don’t have to roll them up with the tent for storage. The poles are also colour-coded, which helps when putting the tent up. The flysheet and floor of the tent have a hydrostatic head of 3,000mm, which isn’t the highest rating on test, but we didn’t have any issues while being hit by a short downpour. It’s ventilated well and, at 1,906g, it’s both lightweight and extremely packable. In a line: A very lightweight tent that would be ideal for ‘close’ friends due to its compact nature. 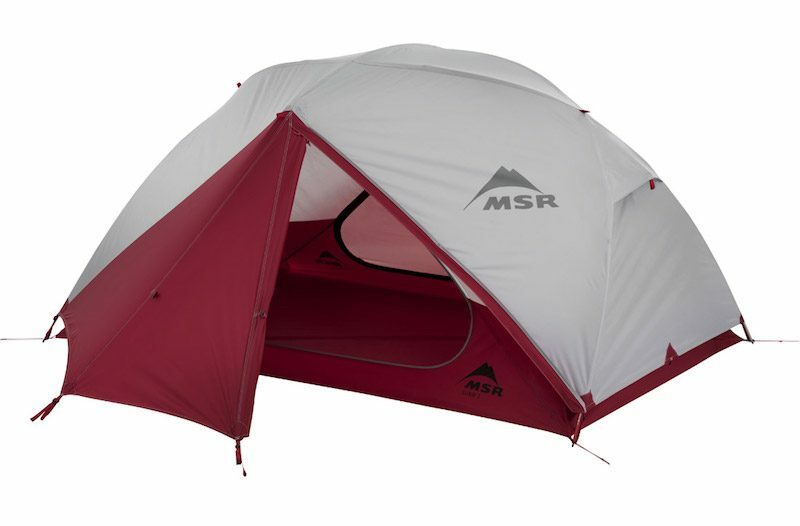 The MSR Elixir 2 isn’t the lightest tent in this test (2,577g with the included footprint, 2,407g without), and it’s not the most packable, so why should it be worth your hard-earned cash? Well, for one thing, it feels incredibly well-built and offers impressive stability thanks to its design. 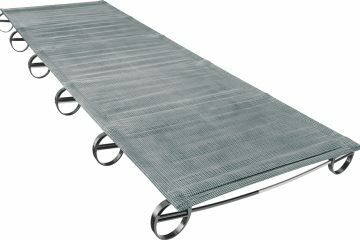 For the weight, you also get a decent amount of features and a good amount of space. I loved the fact that there are two doors and vestibules. There isn’t as much porch space as, say, the Alpkit Jaran 2, but you can just about squeeze in an expedition pack on each side of the tent. Once inside, there is enough space to fit two adults, and there is adequate headroom to allow you both to sit up. 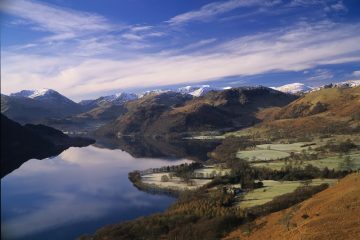 A footprint is included to offer more protection against the elements and to keep your tent in better nick. It’s a nice touch, but when in use there are no pegs leftover for guy ropes. Of course, when you want to travel lighter, you could leave the footprint at home. In terms of features, there are two vents, which help with airflow, and the flysheet zips are two-way, so if the weather isn’t too bad you can get extra ventilation in this way. One of the most frustrating things about putting up a tent is getting the flysheet taut, but there were no issues here, and the Elixir 2 was very easy to pitch. The tension straps on each corner are a great help in this regard and the pegs certainly seemed to be strong enough. It’s worth noting that the tent pitches inner first, so if you’re in a downpour, things could get sodden. This isn’t a deal breaker, though, as it also means you can use the inner on its own in warm, dry conditions. Once pitched, you can move the tent around as it is freestanding, so there should be no issues finding the ideal spot. I really enjoyed using this tent and would happily call it a home from home while on a multi-day trip, so long as I could split the load with a friend. In a line: A well-designed tent that could be the ideal home from home as long as you don’t mind the pack size. Two years ago, Alpkit won our two-man tent group test with the brand’s Ordos 2, an extremely lightweight tent that came in at a very respectable price (just £175 at the time). This time around, we are testing the Alpkit Jaran 2, a tent that is both heavier and more expensive. 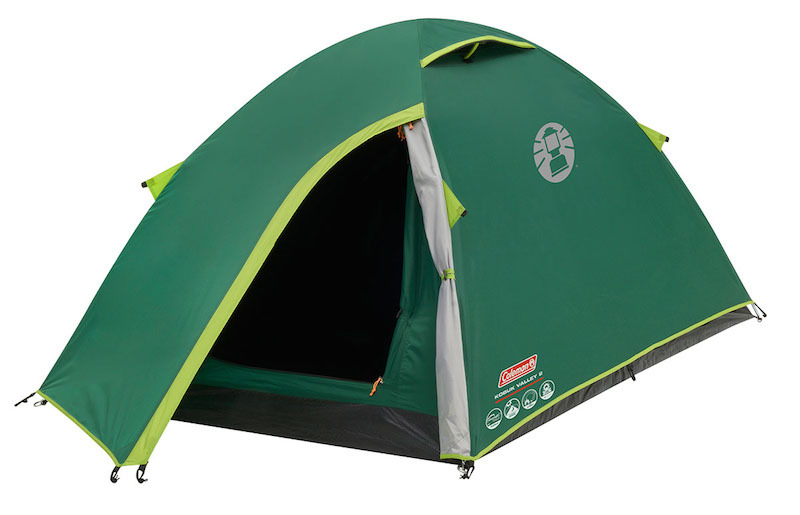 With this rise in both price and weight, however, you’ll find the Jaran 2 is a fantastic tent with a great amount of space. You can easily fit two tall adults and a bit of kit inside, and there is plenty of headroom when you sit up. For any kit that doesn’t fit into the inner, the two porches offer enough space for an expedition pack each. 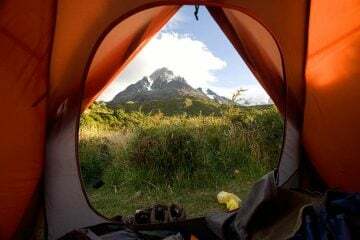 There are two porches and doors, which is great because it means that you don’t have to climb over your camping companion to go to the loo in the night, plus there is extra space to store your kit. It’s pretty simple to pitch the tent (instructions are available online), with a simple design and colour coded poles to help you along. It’s freestanding, so you can easily move the tent to the best spot when it is up and you only need six pegs to secure it to the ground. This freestanding nature also means it’s good on mixed terrain (hard or soft). Once pitched, tension straps on all corners of the tent (and the sides) allow you to ensure the material is taut. We found the frame design (with a cross pole) to be stable in varied weather, while the flysheet (3,000mm HH) kept water at bay. There are some great features inside with multiple loops from which you can hang stuff, plus plenty of side pockets to stash essential items. Ventilation is good, too, with vents and mesh helping with airflow. At 1,794g, it’s lightweight and it has a very good pack size, which gets the Jaran 2 a big tick from me. The only things going against it is that it’s inner pitch first and the fact that the flysheet and floor are made from a 30D fabric (with 3,000m hydrostatic head), which isn’t quite as durable as the materials used by other tents in this test. In a line: If you don’t mind inner-pitch first, this is a brilliant option for you. 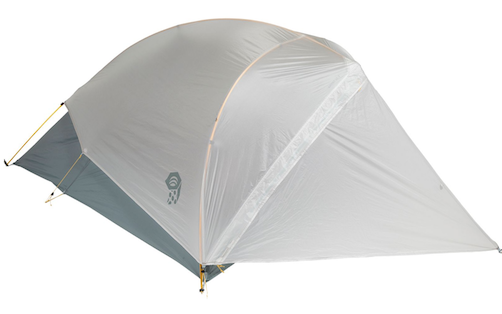 Like some of the other tents on test, the Marmot Vapor 2P pitches inner first. But, it’s worth noting the pitching of this tent doesn’t take much time at all, so even if it was raining while you were setting up, the inner of the tent shouldn’t get too wet. The only thing that took a little bit of time to get exactly right was the tension of the flysheet. Inside, there’s easily enough space for two people, though you won’t be able to fit much else in. There is plenty of headroom allowing you to sit up, which is nice and you’ll find some great features, too. There are pockets on each side of the tent, plus a hook and two pouches that Marmot calls ‘lamp shade pockets’, which are designed to house your head torches to illuminate the tent. 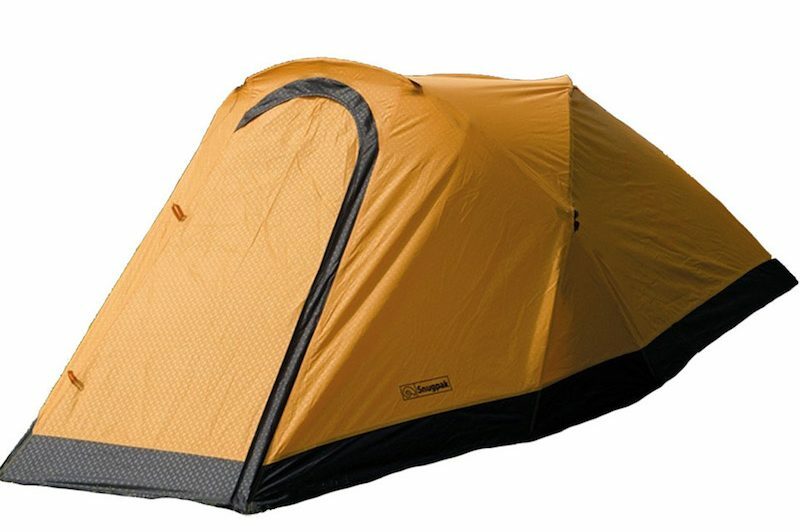 Ventilation is also very good, with a deep vent on either side of the tent, plus two double skinned doors, which allow you to use just the insect mesh. The Vapor 2P is quite a stable tent, and with a couple of guy ropes helping to secure it, it stands up well against adverse weather. In a couple of places the flysheet runs quite close to the inner tent, which may be an issue when the wind is blowing, as condensation could come through to the inner, but hopefully the ventilation will help mitigate this. The tent makes use of two porches and doors, which is great, as it means you don’t have to climb over your pal to get out. There is also just enough space for you to put a rucksack in each porch. This is a high-quality tent that that will certainly look after you, but you might need to purchase a few more pegs (or ask Marmot really nicely) to stake everything out, as we came a up a little short. At 2,740g, it’s not one of the lightest in test, and it’s also one of the least packable, but if you’re always going to be sharing the load with a friend, you shouldn’t let this put you off too much. In a line: The Vapor 2 performs well and has great ventilation, but isn’t the lightest or most packable. 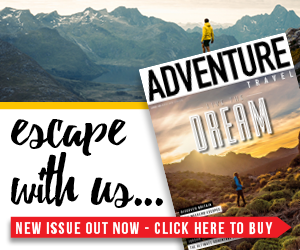 Vaude has been won a few awards in Adventure Travel over the past few years and we’ve come to expect very high quality, functional gear from the German brand. The Terra Hogan 2P tent is the firm’s entry into this test, priced at a pretty respectable £280, but is it going to live up to the brand’s past achievements? Well, the Terra Hogan 2P isn’t quite the simplest of tents to pitch, but if you’ve put up a few different styles of tents in your time, you should be fine (it pitches all as one, which we like). Having said that, the instructions are helpful, and once you’ve put it up successfully once, you shouldn’t have any trouble. The design, with two poles almost forming a T-shape before being bent over, provides a good amount of stability for the tent, and the flysheet is naturally quite taut once pitched, especially when the guy ropes have been pegged out. Speaking of which, we would have liked a few more pegs, as we didn’t have enough to peg out all of the guy ropes. Space inside the tent isn’t too bad and you’ll fit two inside pretty comfortably, while there is room in the porch for gear. It’ll be a squeeze to get two expedition packs in there, but it’ll just about do it. Speaking of which, there is only one porch and it isn’t the easiest to get in and out of. One thing we particularly liked about the porch, however, is that the porch zip opens the entire front of the tent, allowing you to lap up the views and make the most of airflow in good weather. 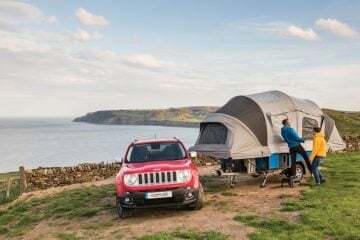 The Terra Hogan 2P has some very good features, including pockets and a washing line inside, and the part-mesh inner door can be unzipped to boost airflow, while still keeping bugs out. Compared to the others in test, Vaude’s offering is in the middle of the pack with regards to its pack size, so we’d definitely recommend splitting the load. Despite its size when packed down, at 2,328g, it’s not actually that heavy. In a line: The Terra Hogan 2P stands up to the elements well and has some great features. 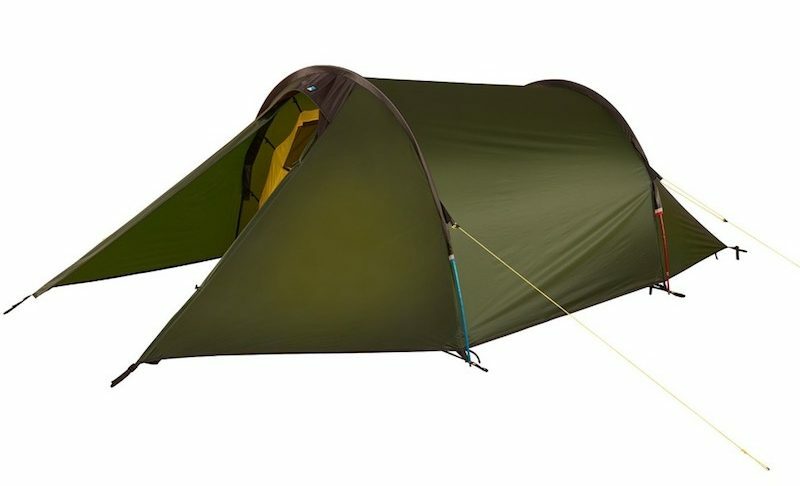 I found the Mountain Hardwear Ghost UL 2 the trickiest tent to put up; it wasn’t plain sailing. Though, once I’d got my head around the instructions, I managed to get it up. I have to say, I’m not sure how comfortable I would feel camping in bad weather in this tent, as the flysheet doesn’t cover the entirety of the inner. Part of the inner is waterproof, but I’m still not sure I’d like to be in this tent when the good old British weather is doing its classic sideways rain thing. The design does, however, ensure very good ventilation. Weighing in at 1,111g, the Ghost UL 2 tent is the lightest tent on test by quite some way, but it is also quite small. With this in mind, you’ll probably be quite up close and personal with your camping buddy, and there wasn’t much head height when I sat up, either (I’m only 5ft 6in). There’s just enough room in the porch for your expedition rucksacks if you squeeze them in tightly together. Being so lightweight, this tent is perfect for shoving in an expedition pack and hitting the multi-day hiking trails – I wouldn’t even bother splitting it between two people, it’s really not going to weigh you down that much. The flysheet and floor of the tent don’t have the highest of waterproof ratings, so it’s probably not the tent for you if you’re likely to be getting rained on for hours on end in the Lake District. The shape of this tent would battle well against winds, however, as it has a low profile to the ground. There are two good-sized storage pockets on the inside of the tent, but that’s it. You don’t get any extras, but I guess that’s how the company got the weight down. On that point, it’s worth considering that this tent is aimed at those that travel fast and light. Like, really fast and light. 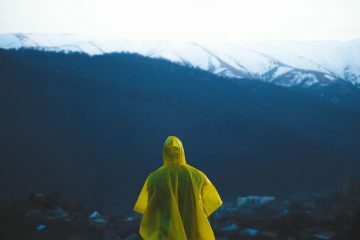 It’s not going to be the one for you if you’re planning to use it as a base and go on day hikes, or if you’re going to be in really adverse weather. But, if the forecast doesn’t look too bad, it’s a great option for the lightweight brigade. In a line: An incredibly lightweight tent, but it does sacrifice on space and weather protection. Terra Nova is well-known for manufacturing high-quality tents, and the brand has impressed me here with the Starlite 2. Weighing in at 1,584g it’s incredibly lightweight, yet it seems that despite this, the brand hasn’t made any sacrifice when it comes to space. There is plenty of room for two people to sleep, with lots of leg and headroom. It has a good-sized porch that is spacious enough to store two expedition rucksacks and there is also room to shelter from the rain if you’re cooking outside of your tent. The Starlite 2 is easy to erect, with colour-coded poles helping to keep things running smoothly. The simple tunnel design pitches as one, which is fantastic because the inside won’t get wet if you’re putting it up in the rain. Inside, the tent offers good ventilation, with a mesh panel on the inner door and a large vent helping to get that airflow in. There are also two generously-sized storage pockets, which are great for stashing the essentials. Packing the tent down was just as easy as putting it up, and again, I just couldn’t believe how small and compact it packs away, or just how lightweight it is in your rucksack. I’d feel no need to split this tent between two people’s rucksacks. It’s incredibly waterproof too, with high levels of water repellency (5,000mm hydrostatic head for the flysheet), while its low and streamlined profile meant we didn’t have any issues when facing up to the wind. The guy lines are reflective, which should aid you a little when it comes to not tripping over them in the night, and they’re incredibly tough as they are made from Dyneema, which is said to be three times as strong as standard guy lines. Unfortunately, there aren’t quite enough tent pegs to be able to peg them all out. I always think tent manufacturers skimp out on tent pegs and often find I have to buy additional ones. In a line: The Terra Nova Starlite 2 tent is incredibly lightweight, yet it doesn’t sacrifice on space. The Fjällräven Abisko View 2 tent pitches outer first, which is fantastic, as it means the inside of your tent won’t get wet while you’re faffing around trying to pitch it. It’s simple to erect, with two main poles that slide into the pole sleeves and clip in, before needing to be pegged out. Then it’s a case of clipping in the inner tent and, hey presto – the tent is up. 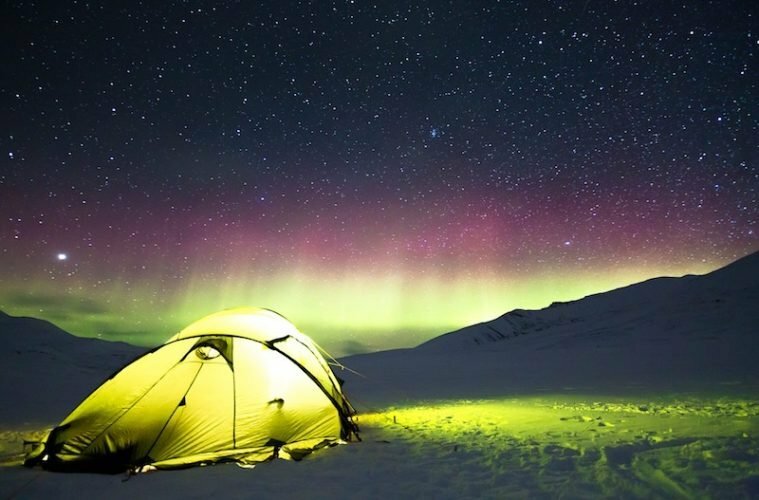 There’s adequate room for two people to sleep in this tent, though you won’t be doing any starfishing. However, I was particularly impressed by the size of both of the porches on either side of the tent, where there is plenty of room for your expedition pack, your boots and to sit and shelter in while prepping dinner. Also, two porches mean you won’t have to climb over your sleeping partner if you need to get up first. The tent offers good ventilation via two large air vents on the flysheet, which is helped by the inner being constructed of a mesh material. Impressively, the porch doors can actually be secured in a part-open position, allowing you to retain ventilation while still keeping the rain off (though we don’t recommend trying this in sideways rain!). There are six good-sized pockets, and there is a good amount of head height when you sit up. There is also an internal washing line on the inside of the tent. 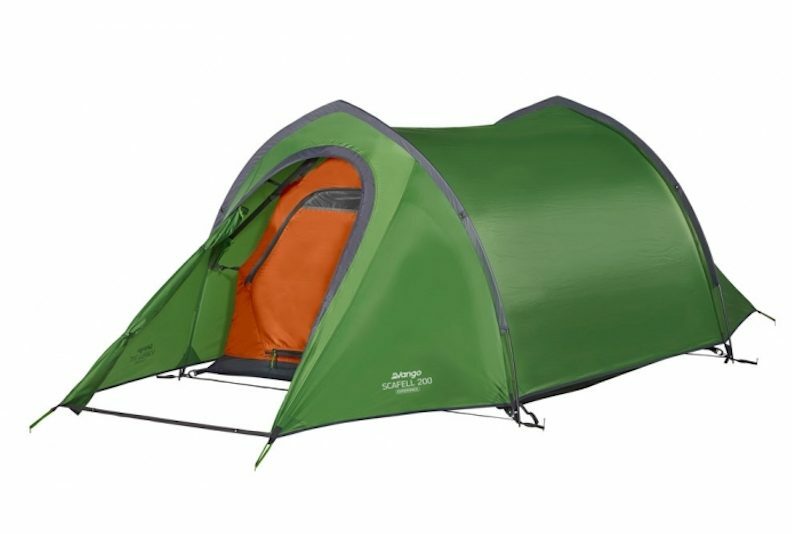 The shape and cross-over pole design of the Abisko View 2 makes for a very stable tent and we had no issues with its water repellency, either. One thing we particularly loved was that you can roll the porch fabric away entirely, allowing you to make the most of the views in nice weather. The Fjällräven Abisko View 2 is easy to dismantle and packs down nicely into its storage bag. Surprisingly, although it’s one of the most packable, it’s also at the heavier end of the scale (2,700g), but for this you do get a lot of space and features. In a line: A great, sturdy tent with two generously sized porches. In need of more gear recommendations? Head over to the gear section of our website where we frequently review the best, new and highly recommended outdoor kit on the market.